And this I like. Ligeti's music (...) is too often reduced these days to the status of modernist lollipops. But Lintu finds something fresh by reconnecting with its radical core. 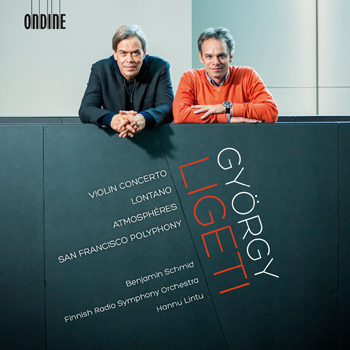 Ondine proudly presents a release of the Violin Concerto and orchestral works by György Ligeti (1923-2006) featuring Benjamin Schmid, the Finnish RSO and Hannu Lintu. The disc presents an excellent overview to the development of Ligeti's compositional technique over a period of 30 years. One of the most impressive developmental progressions in the history of 20th-century music. Ligeti was inspired to use the violin as a solo instrument to explore the entire history of music. The work incorporates influences from Medieval and Renaissance music, to the late Romantic and contemporary styles. In the third movement of the Violin Concerto Ligeti gives the impression of complete chaos, freedom and spontaneousness despite detailed and thorough performance instructions. Performing Ligeti's works is technically very challenging. Although there is often a high amount of pressure and intensity it often leads to an imagination-fuelling and mind-blowing experience! Chief Guest Conductor from 2012 on, Hannu Lintu will assume the post of Chief Conductor of the Finnish Radio Symphony Orchestra with the new season in autumn 2013. He has rapidly been creating an international career and is a sought-after conductor. This is Benjamin Schmid's and Hannu Lintu's second collaboration for Ondine. Their first release, Reger's Violin Concerto (ODE 1203-2) with the Tampere PO was highly praised e.g. by Klassik-Heute.de.